I've seen some of the text to Hero's Journey and I'm excited to give this a run for it's money with my regular gaming groups. James has also promised me I'll have access to a copy of the rules prior to NTRPG Con, so add Hero's Journey to the list of games I'll be running (StarSlinger was pretty much a list of one prior). Hero's Journey is a fantasy roleplaying game written by James M. Spahn and published by Barrel Rider Games. Inspired by Swords & Wizardry White Box, this complete game features six races, fourteen classes and is the result of years of game design. Combining and updating material found in Swords & Wizardry White Box, the White Box Omnibus, and introducing new rules for character races, character classes, character professions, new magic spells, new magic items, new rules for magic item creation, new combat mechanics and new rules for character progression, Hero's Journey is a refinement of Swords & Wizardry White Box that includes influences from Warhammer Fantasy Roleplay, AD&D 2nd Edition, and other classic fantasy roleplaying games. At over 200 pages, this single-volume book will include everything players and referees need to play. 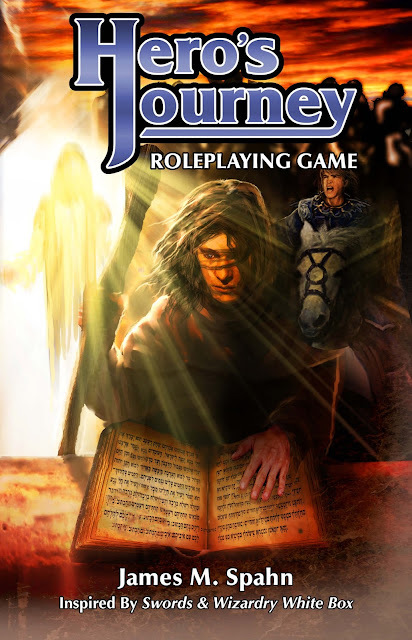 Hero's Journey will be available in PDF and 6" x 9" digest format through One Bookshelf. Print on Demand copies will be available in both black and white interior and full color premium interiors. Scheduled for release in the third quarter of 2016. Damn, I hate waiting for these.